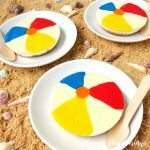 Decorate mini cheesecakes to look like colorful beach balls to serve at your pool party. Spoon a heaping tablespoon of crumbs into each of 18 round cavities in 3 silicone molds. Bake for 8-10 minutes until fragrant and golden brown. Spoon 1/3 cup of filling into a bowl and color it blue. Repeat, coloring 1/3 cup red, and another 1/3 cup yellow. Color 3 tablespoons of filling orange. Pour individual colors of filling into squeeze bottles. Spoon the plain filling over top of each of the crusts, diving filling equally. Pipe red, blue, and yellow beach ball panels onto the plain filling. Pipe an orange circle in the middle of the cheesecake beach balls. Bake for 16-22 minutes until the edges of the cheesecake look set. The center will still be jiggly. Freeze for at least an hour until firm enough to remove from molds.